Stay Ahead of Dirt This Summer! With heat on the rise, traffic through your home may look a bit like a highway. You might find yourself chasing the kids around the abode; and the kids are chasing the dog. Meanwhile, the dog is chasing the cat, and the cat is chasing God-knows-what. And the whole convoy seems to be circling around and through the house like a fly. In short, your family is kicking up a lot of dust. Not only dust, you’re finding mud handprints on the wall, grass stains on the carpet, sand in the tub, scuffs on the hardwood, and the list goes on. So, it’s time to declare war on summertime grime. When it comes to summertime cleanliness tactics, the Boy Scouts put it best: “Be prepared.” Let’s talk about a few tips and tricks that you can employ to prepare your home for summer dirt, mud, and dust. Here’s how you can defend your home from the summer onslaught of summer dirtiness. There’s a reason the doormat was invented… So use it! Be sure to purchase a heavy-duty mat that has some grit to it. You’ll pull off more dirt and debris with a thicker, rougher mat. Also, invest in a boot brush for those really heavy-duty days—the days where it’s pouring outside and you have to throw on your cowboy boots to feed the ponies… Or the days when your kiddo leaves his favorite stuffed animal in the sandbox that’s filling up with sprinkler water. 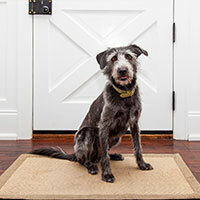 Place one mat at each door, preferably on the outside of the house (if the mat won’t get wet)—you’ll keep more dust outside of the abode with exterior mats. You might even consider placing a shoe holder outside just for the warmer months, at least to hold those especially muddy shoes (e.g. your gardening Crocs™, your beach sandals, your cowboy boots, your rain boots, the kids’ cleats). Keep any dirty pairs of shoes and any stinky pairs outside to air out. This goes alongside our last point, if you’re wearing shoes outside, just take them off when you enter the home. It’s a simple habit, and it’ll save your floors from dirt, mud, grass, and scuff marks. Place a shoe holder and a bench near the doors of your home, and have guests and residents kick off their kicks as they enter your abode. You’ll save your carpets from needing a deep cleaning every six months. 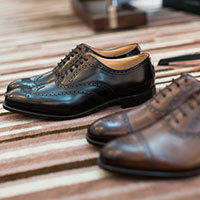 If you like wearing shoes in the house, you can keep a comfy pair of loafers or slippers waiting at the door for your arrival. OK, I know you always take your shoes off at the door, every single time. But what about the kids? Teach your tykes good habits to keep all that dirt where it belongs, outdoors. If you’re teaching your kids to take off their shoes at the door, or to close the door behind them, offer up a reward for good behavior—you know what they love. A piece of candy could be the key to keeping your household dirt-free. Also, if you have a pup around the house, you can clean his or her paws too! You may not have to clean your dog’s paws after every jaunt outdoors, but it’s a huge help if your doggo went out to jump in mud puddles. Keep a few spare rags near the entrances to your home. Wipe your pup’s belly and paws (or whole body if they took a swim!) if they’re wet and muddy. On another note, it’s especially important to keep your trash covered or sent to the curb In the summer. Houseflies and fruit flies are prolific little beasts, and they’ll jump at the chance to make your home their habitat. Stay on top of the bug problem. Remove any food sources that these flies can find. Keep food covered, and keep trash out of the house. Dust is constantly attempting to make its way into your house, especially in spring. As flowering plants and trees exhale pollen, the air is filled with a fine dust powder—thus the sneezing, runny nose, and itchy eyes of allergies. So it’s time to keep your screens and filters up-to-date. Although your window screens won’t do much to keep fine particles out, they’re necessary to keep out the bugs. As for filtration, take a look at the filter on your air conditioner. If it’s old, it might not be doing its job (and it’ll be inefficient for your AC system). 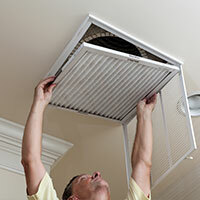 Replace your air filter to keep dust at bay. You can even purchase a home air filter if you’re really trying to stay on top of the dust problem this summer. Dyson produces some pretty cool air purifiers that are designed to capture particles and pollutants, and they may help with your allergy problem! It can be difficult to keep up with the dirty days of summer. We know first hand. After all, that’s why we’re here. When summer is kicking up dust, we’re here to make sure that your home stays clean (at least for a little while!). Count on us for regular house cleaning, or, if you prefer, you can call on us for a one-time, thorough spring cleaning to get ahead of the upcoming summer. Get in touch with us if you have any questions about our maid services, and feel free to make a reservation for a cleaning right here online!